When we consulted a nutritionist for our DD's diet she said that I can give her brown rice because it is rich in fiber. Typical Filipina that I am I always buy white rice. So I made a switch and tried brown rice. At first I don't like it since it is coarse for me. Then later on I like it more and since then I always buy brown rice already. Brown rice is still the same rice that we ate except that its bran is still intact. This is why its called whole grain. Being rich in fiber it is good for our diet. 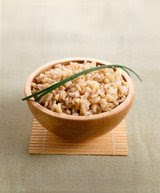 We need fiber in our diet everyday and brown rice is one good source of it.